Last year, the government announced that the town of Jasin, Malacca, will be the lucky first residents to enjoy the fastest Internet speeds in the country, and it’s happening right now! 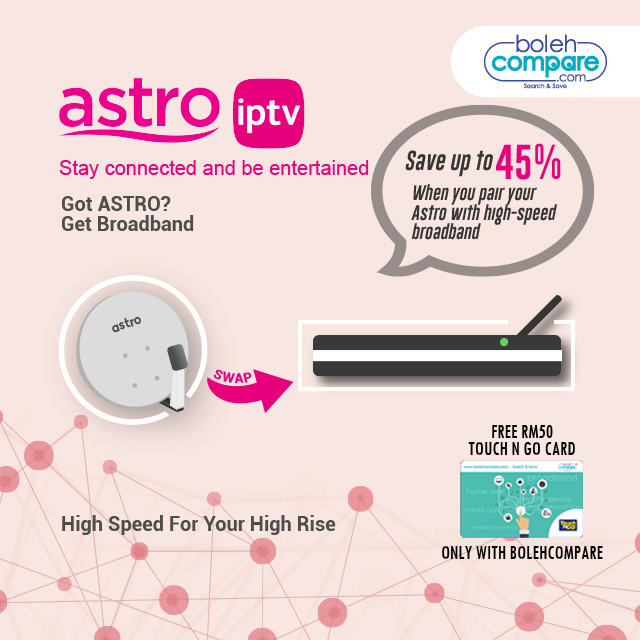 On 8 January 2019, Astro announced that it’s offering two packages to Jasinians at really, really affordable prices. Read on to find out more! Some of you might recall that Tenaga Nasional Berhad (TNB) was considering the possibility of entering the high-speed broadband service, as it already has fibre optic cables in place for its own infrastructure. Although talks between Telekom Malaysia (TM) and TNB eventually broke down, Astro took up the baton to collaborate with TNB, and they’ve finally rolled out their offers just last week. The more affordable of the two packages is the RM99 plan, which comes with 50Mbps speeds for – you guessed it – RM99 a month. But that’s not all. Astro is also bundling its Astro Family Pack content at that price, which means that you stand to enjoy more than 40 TV channels such as Astro Ria, Astro Awani, NatGeo WILD, and FOXlife. If you want faster speeds, opt instead for the 100Mbps plan for only RM129 a month. It will also come bundled with Astro’s Family Pack channels, so you’ll probably find it really hard to choose between movie streaming and Astro channels! For starters, you must be a resident currently residing in Jasin, Malacca, because that’s the test run for this project. Unfortunately, not all of Jasin can enjoy this perk yet: to those who live in Taman Merbau, Taman Maju, and Felda Kemendor, you’re in luck! Astro will contact you if you’re eligible for this promotion, so sit still and wait for that call! Since this is a test run, Astro has chosen an area where its household penetration is relatively high. These three areas have an estimated 1,100 eligible homes, giving Astro a 92% household penetration rate if its Astro and NJOI subscribers are combined. To make a sweet deal even sweeter, existing Astro customers in Jasin will be able to enjoy more promotions during the month of January 2019! If you’re an existing NJOI customer looking to sign up for these packages, Astro will give you a free upgrade to Family Pack plus complimentary broadband access until 31 January 2019, after which you can continue enjoying the service by subscribing to one of the two packages mentioned above. For Jasinians considering the leap, here’s a brief cost comparison for you: TIME has a 100Mbps plan for RM99/month, but no TV channels; Maxis has a 100Mbps plan for RM129/month which gives you unlimited local calls; and unifi offers a 100Mbps plan for RM129/month also, with 600 minutes of talk time, unifi TV pack, playTV access, and a chance to win a UK trip for two. In short, get Astro if you want a movie-bingeing bundle, TIME if all you want is Internet, and Maxis if you want to call, call, call all day! The broadband industry seems to be continuing its momentum from 2018 towards a good start in 2019. Hopefully, there will be more good news to come!